The three-day Made in Hawaii Festival in Honolulu on the Island of Oahu takes place Friday Aug 21 through Sunday Aug 23, 2015 at the Neal Blaisdell Exhibition Hall and Arena. 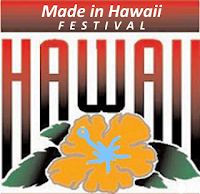 This popular extended weekend event features "Made in Hawaii" products, including cultural items, food, books, art, gifts, fashions, plants, crafts, produce and more. Plus cooking demonstrations and ongoing entertainment. The annual event includes approximately 400 vendors selling Hawaii food products, books, gifts, apparel and jewelry, arts and crafts, produce and other home-grown products from the 50th State. Na Hoku Hanohano Award winners bring their musical talent to the entertainment stage and Hawai'i’s award-winning chefs heat up the arena stage with cooking demonstrations and tasty samples. Honolulu Attractions, Vacation Rentals, Restaurants, etc.